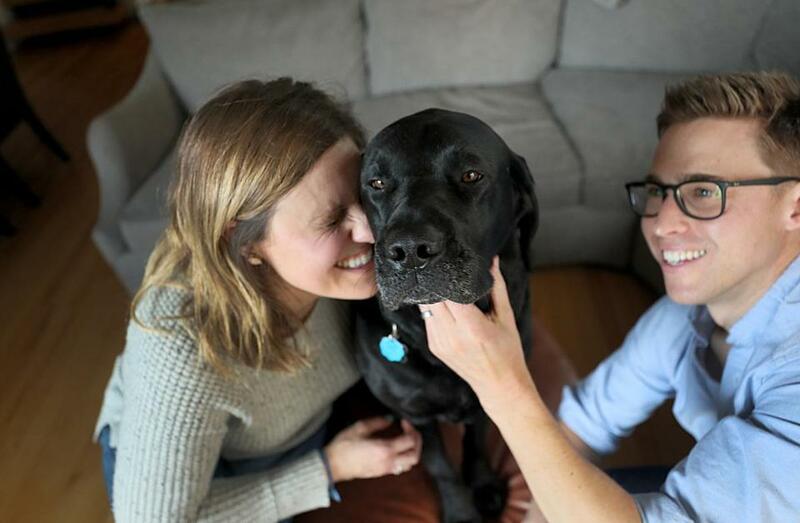 Jessica Kensky and her husband, Patrick Downes, with Rescue. As heartwarming stories go, the one told by Boston Marathon bombing survivors Jessica Kensky and Patrick Downes in their new children’s book “Rescue & Jessica: A Life-Changing Friendship,” is a pretty good one. And we’re not the only one who thinks so. The book, which has cracked the New York Times’s latest Children’s Picture Books best-seller list — it’s currently No. 4 — is the story of Kensky’s relationship with her service dog, a black lab named Rescue. Newlyweds at the time of the bombing, Kensky and Downes both lost their left legs in the blast. The book, which doesn’t name Boston, focuses on the support and help that Rescue provides Jessica. As part of their tour to promote the book, Kensky, Downes, and Rescue will be at the Fairmont Copley Plaza Hotel Saturday for an event dubbed “Milk and Bookies,” where they’ll read from the book — actually Rescue will not be reading. The hotel’s canine ambassador, Carly Copley, will also be there. The couple will be promoting the book at appearances in California, New York, Seattle, and the Washington, D.C., area, where Kensky and Downes spent a lot of time recovering from their injuries. Closer to home, they’ll be in Reading May 1 — that’s where the illustrator Scott Magoon lives — Waltham May 19, and in Falmouth July 21. Some of the proceeds from the sale of the books will go to NEADS World Class Service Dogs, the Princeton-based nonprofit organization that trained Rescue.